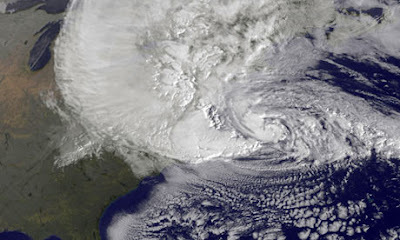 Last night Hurricane Sandy touched down on the East Coast and the rest of the world hunkered down to watch it play out. Partially because they wanted to see if it would cause the mass destruction they heard that it may and partially because other shows were cancelled due to the power outage in that small corner of the world (I know...don't get me started). Of course we were watching CNN and their group of reporters that were planted in different areas around the north east and giving updates of the storm. Some, standing for hours in flooded streets or any other place that they may possibly get knocked out by the wind or a freak flood wave. My hurricane hero this time around was CNN reporter Ali Velshi who was planted in the middle of a knee high flooded intersection in Atlantic City and taking a beating from the wind.What a trooper. We all know why these reporters are made to do this: because we like watching them suffer (even if you say you don't, you do) and it gives the stations more viewers. They would like for you to think it is because you get a better idea of how bad the storm is and it serves for caution to people who may think it 'fun' to head out into the storm. But mostly it is for the first reason. We take pleasure in other people's pain. So did we get to see anything good while Sandy was doing her business? Besides Ali Velshi taking a beating...not really. I did a little search and found some things that, if presented to you live all in one night it would have been a pretty interesting news night. Fun times. No for real...if I was a reporter I would be volunteering for this kind of thing FOR SURE. I would especially like to get knocked out on camera (but live, obviously) so I could be a legend...a legend that got knocked out by Mother Nature.